Playcanvas, an up and coming HTML5 Game engine, is making some waves on the scene by pulling off 3D development. It currently utilizes WebGL so IE is not supported, but you can bypass this with Google Chrome Frame if needed. I took about five minutes to play with the engine, and felt it was definitely a good beginning, and I can’t wait to see what these guys can do. Check out the D.E.M.O. they have been working on for a preview of what the engine can do. HTML has been the language of the web for over almost 20 years with the first standard being accepted in November of 1995. Many of us have been using the language even longer and throwing around <img> , <a>, and <p> tags are second nature. In the past it has always been hard to integrate video on the web without the use of plugins. At some point most of us have all been prompted to download the latest version of Flash, or update Quicktime to enjoy a video clip. With the latest HTML specification there is now a <video> tag that allows for native playback of video in the browser. This addition will allow for better playback performance, and will open up new and exciting ways of interacting with video on a web page. Keep your eyes open, because we are going to see an explosion of this type of video interactions in the coming years. HTML5 may not be standard quite yet, but that shouldn’t stop us from playing with and pushing this technology forward. I am definitely looking forward to the future of the web, and technologies like this will surely sharpen that vision. Near the beginning of 2012 we switched our business’ project management over to Basecamp. Previously, I used Basecamp, and was impressed with their system from past projects. My last experience with Basecamp was around 2008 so I expected major improvements, and was eager to get our company and our partner company on board. When you embrace a new system into your business it always takes time to train employees, and also yourself. I had a great feeling about Basecamp, and as a result I didn’t do much research on other project management systems. We needed something simple, and clean. We have a small bunch that is some what technically savvy, but some have trouble finding the reply button for emails. I thought Basecamp would be simple and flexible enough for all of us to integrate. We have been using Basecamp for about 6 months now, and I have just been getting this bad feeling about it from day one. Well, when we sign up for the service the interface had COMPLETELY changed from the system I used in 2008. I knew they had new system, and were not letting people sign up for the old version so I took this as improvement, but quickly found the opposite. The portfolio view is pretty to look at, but not very functional. If you have tons of companies that you are working with then you are constantly scrolling down the screen to find them. So, I changed the view to the “list” option and this view lacked the feel I was hoping for as well. You lose the images of who is connected to the project, and it’s almost too simple! Then I changed to the featured/list view, but I wouldn’t use this view because my featured project changes daily or weekly. It would be work just to maintain this view. I didn’t let this small issue stop us, though. We continued to use the system, and found that it worked well. Then I began noticing small things that should be possible were NOT! Didn’t the old version have project templates? Apparently, this version does not. That seems like a downgrade to me…I thought this was the new system!?! Oh, I can’t email in tasks? Hey, how do I duplicate a task? NOT possible! Can I filter or sort this task list? NOT Possible! Wait, isn’t this kind of functionality expected these days? And are we not paying a monthly for this?!?! So, I began to run into a lot of little things that can add up to a lot of missed productivity. It was time to find something else. Edit: you can now email in tasks to Basecamp. A few days ago I started researching project management apps, and came across a looooooong list of clones, and other products/services. The only one I felt was similar to Basecamp, yet more advanced was Do.com. Do.com is a web application with collaborative task/TODO lists focused on projects and tasks. I actually ran into Do.com while searching the Google Apps Marketplace. Google Apps is the backbone of our email, and document sharing so I wanted something that would connect. Do.com is developed by Salesforce, and has been making some waves in collaborative task management. Do.com allows you to sign in with your Google Apps account from the start! This means it saves me time training employees how to login and remember passwords for yet another web application. They can just type in their current email address and password and start using the system. The interface is clean, but also offers much more depth than Basecamp. You can keep all the tasks on the screen when drilling down to a single tasks. This makes moving between tasks much more efficient. There is the ability to create project templates, which will save us a lot of time, and help us refine our processes. You can email in task by sending emails to task@do.com. So simple! Oh, and look at that! It is possible to filter tasks, and you can even create sections for organizing tasks! Another awesome feature is the ability to attach Google Docs from your Google Drive. That alone was almost enough to sell me. Do.com also has an open API for developers. Sometimes, a task requires documentation, and I do all of mine in Google Docs. I was amazed and for the low price of FREE (there will be a premium version later), I started moving all of our projects over to do.com. I knew the team would love learning a new system just after getting to grips with Basecamp, but it would be worth it in more ways than one. When I researched project management systems/ TODO List I also came across Asana which was created by some former Facebook developers. Wow! This system looks great too! It is pretty much Do.com (or vice versa), but with a few additional features. I noticed that you can add tags to tasks, which adds even more sorting, filtering possibilites. Asana also makes it apparent they have lots of shortcuts which are conveniently placed at the bottom of the screen. Hmmmmm… I think we will stick with Do.com because it looks cleaner/simpler, and the Google Apps integration is better. My only complaints about Do.com at this point is the small view for task/TODO comments, and the lack of an option to edit the comment. The tasks view in general should be given an option to expand and give you more formatting controls ie the task detail page for Basecamp. The option to track the time spent on a task would be nice so that we could import that data into Freshbooks. Also, the lack of tags for tasks could be “easily” fixed. I will be paying close attention to Asana, and other cloud hosted project management apps that emerge. Another one I have on the radar is Teamlab. For now I am sticking with Do.com, and it looks like our company will too! August 15, 2012 EDIT: Do.com made some changes to the interface yesterday. It looks better, but I don’t see much functionality change. I sent a feedback message to their team stating I would like to see templates for task list. This would allow you to add a list of tasks to an already existing project. Well, I am still at a questionable position in developing a 2.5D game with ImpactJS. The system is pretty rigged and I am still running into bugs with collisions and gravity. Also, the backgrounds are way too large at this point. I may just use this as a side project and begin focusing more on just a 2D side scroller. In any event I have learned a lot about ImpactJS, and am impressed with the engine’s abilities. I plan to continue developing with it and feel that Dominic will continue to improve the scripts. The past week I spent a lot of time manipulating ripped sprites from Scott Pilgrim. Again, these tests are just for demo purposes. The game’s sprites and backgrounds were all created by Bryan Lee O’Malley and Paul Robertson. I was able to get more of the first level entities in and it feels more 2.5D-ish now that you can walk behind all of the level’s entities. As you can see, it is also possible to load in the camera’s position as well. I’m using a camera that works similar to Shaun Inman’s , and uses the code described HERE. This works reasonably well and you can have multiple boundaries for an area that are dependent on the player’s Y position. The last value, slope, allows you to create a gradual sloping boundary to the next point/area. One bug that I am trying to squash is the transition between each area. Usually, the player continues to press right or left to navigate. For some reason the game’s continuous update cycle known as the game loop, is not detecting the player’s position and keeping them inbounds if the left or right button is continuously being held down when transitioning between areas. I think it something that can be overcome, though. I was also able to add animations when the player and the enemy receive damage. Ramona’s is just her crouch sprite so it looks a little ridiculous, but conveys the feeling until we get our real sprites in. It took me forever to get the player’s “received damage” sprite to continue animating. I eventually made sure no other animations were being loaded for at least a second after the collision. So, it’s actually starting to look like a real game, rather than a moving heap of crap. I may end up throwing away most of this when working on the real game, but I have taken away many lessons. In other news, I had a great weekend with my family over in Corvallis, OR. We celebrated my brother-in-law’s recent graduation and ate some amazing BBQ. Of course, we drank more than a few Oregon beers and ended the night by the campfire. 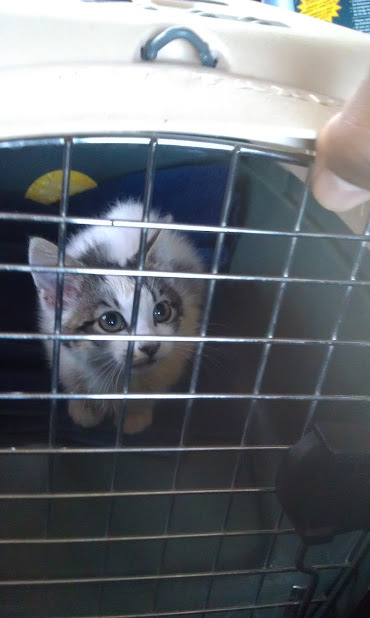 On the way home we obtained a brand new kitten that is now cat number two on our Rescued Kitty Team sponsored by Kids, Clutter, and Chaos. We also stopped by Odell Lake to drop off a birthday gift for my nephew, and thank him for rescuing our new family member. Now, I am all ready to go for the week ahead. Peace and love until next time! The past week has been a blur, and I am trying to refocus so I can take on the next one. If you tuned in last week then you know I am steady trying to recreate the first level of “Scott Pilgrim: The Game” with ImpactJS. So far, it has been a little rough. I know that ImpactJS is a 2D game engine, but I am determined to get a 2.5D demo working. I don’t know why I am fighting the engine, but I like this one better than any of the others available. I know that the main issues I am facing will be resolved with either a different game engine or ImpactJS will expand into the 2.5D realm. Entity to Entity: In the last week I made improvements to the collision detection for enemies and the player. I am keeping all of the hit boxes for entities at their feet. In a 2.5D world the only things we really need to check for is hard collision at the feet. That would at least let us use the engine’s built in collision detection and we can program our own in for the rest of the body based on where the feet are. This may not suit everybody’s needs, but mine does not require pin-point hit detection. Entity to Map: Because we can’t use the engine’s built in collision maps, there had to be a way to keep the player bounded. There is now a way to create a bounding-box/collision-layer that dynamically changes in relation to the player’s X coordinate. This allows us to load in a level’s boundaries with JSON, and enable different boundaries for the player depending on their X coordinate in the level. One of the reason’s for not using the built in map collision is because your player can’t jump with static collision boxes above them. The new system allows you to turn off/pause the dynamic collision map while jumping, and resume once the player is standing. I was also able to get a hole/pit working with the game engine’s physics still controlling the player’s fall. One of the major issues I am having with tricking ImpactJS into a 2.5D world is the loss of the game engine’s built in physics. After playing with many ideas I came up with an OK solution that will do for now. When the player hit’s a hole there are special tiles that detect this, and add gravity back to the game. The dynamic collision map is turned off at this point allowing the player to fall, and die. Another accomplishment this weekend was the edition of breakable objects. You can now break the safe box near the beginning of level1 , and I am slowly adding more breakable entities. This past week saw many more additions, and fixes such as corrected player animations for left and right movement, new sounds for attacking, many more objects added, custom enemy AI, and a scripted bus that makes a bus stop colliding with the player! The game development is moving along nicely, but there is soooooo much more to do. Check out the latest version and I will update you on the progress next time. Thanks for tuning in, and I’m sorry for missing the beers this weekend PNate. You know I have become addicted to this stupid game. Will put it on pause after the next life! PS – Yes, that is an African-American version of Link. And no… I didn’t HAVE to color change Zelda’s sprite. HA! Happy 4th of July you guys! Please keep in mind this is a concept-of-proof demo. Much love to Paul Robertson and Bryan Lee O’Malley who’s hard work can be seen in the sprites of Scott Pilgrim and other games.